Q: Does the game have VR Support? Q: Can I build any rig I want? A: Yes, the game has a Free Build mode for that, with all currently available hardware, with no costs. 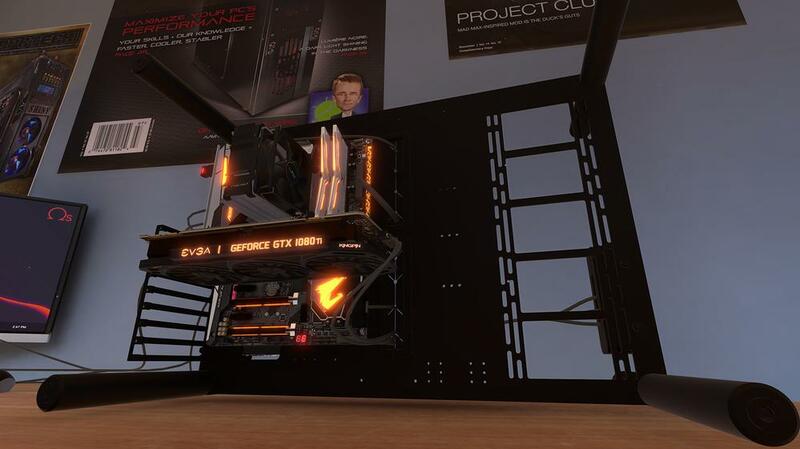 Q: Is there SLI / CF support for in-game rigs? A: All motherboards have at least 2 PCIE slots, but SLI / CF are currently not available. Q: What about water coolers? A: Nor closed loops nor custom WC parts are available at this moment. First of all, your uncle is a big ol' bag of d*cks. He gave you the workshop, but got money for gas so you start the game with negative $15 on your account. If you have -$1000 or more, you can still buy stuff. Simple as that. If you have less than -$1000, the bank will charge you $10 each day. If you have less than -$3000, you can't buy anything! If you reach this value and can't finish your jobs or sell spare parts to get above -$3000, you can't continue on that save file. You start with only 1 workbench. You can unlock the second one at Lvl. 3 and the third one at Lvl. 8. Yeah but why should I buy then? 3D Mark. You'll need to run 3D Mark on this machine. And the other machine too. And the other one. And another one. I'd say 85% of the machines you pick up, you have to run 3D Mark on it for testing purposes, and the test takes around a minute, plus installation and restart times (around 15 seconds). If you don't have other workbenches, you'll have to sit and wait, and that's not fun. Try to have 3 rigs at the workshop or in transit the whole time. That's the limit. You won't receive any e-mails while you have 3 rigs in the shop / in transit. When you finish a job and collect the money, you'll get another e-mail with another offer, and when you pick a job, the machine will always arrive the next day, so always try to leave the workshop with no rigs on it and 3 on transit for the quickest profit. At the time of creation of this patch (March 28th), you can't see the client's specs in the e-mails, so you may or may not get a profit from it. Sometimes the client wants a 2TB HDD, which costs $70, and he'll pay you $60 for the job. In that case, you can just decline. However there's jobs which involves discovering the problem, and the fix might cost more than what he's paying you. I have yet to cancel a job. If you want to do so, just open the respective e-mail and click on Quit. That will make the client's rig vanish from the workshop. Generally speaking, the jobs don't pay you too much. You'll almost always stay on negative balance (or maybe I'm just too bad with management). However, the game does not punish you for not being honest. There's certain jobs that requires you for example, to just change the broken HDD. You open the rig, and it's a 2TB HDD. You can put a 250GB HDD on its place and still receive the money with no penalties or anything. This works with every job that requires you to only change specific part(s). Do not accept jobs that wants uber 3D Mark Scores. 3500 should be your score limit. Clients often wants to pay ~$170 for a rig with over 4000 on 3D Mark, and you need expensive VGAs / CPUs for that score, usually around $700 in total price. Don't worry with correctly removing cables or turning off the PC when you're swapping hardware. PC booted up and it's ready for delivery? Just pick it from the workbench and put it on the hallway, no need to turn it off then remove the cables before picking it up. The same goes to the Flash Drive and installed programs. You do not need to remove then before returning the rig to the hallway. If you don't have enough workbenches, you can pick a rig the way it is and put it on the hallway. It will stay there until the moment you finish the job, so don't worry. If a specific part in your inventory have a note with the owner's name, that means you can't change it. That usually occurs on "Diagnose and fix" jobs. If you think for example that the PSU is broken, remove it and there's a note on it, that means it isn't broken. The problem is in another piece. The storage on the left (the one you can unlock at Lvl. 6) serves only for putting rigs on it instead of the hallway. Nothing more.